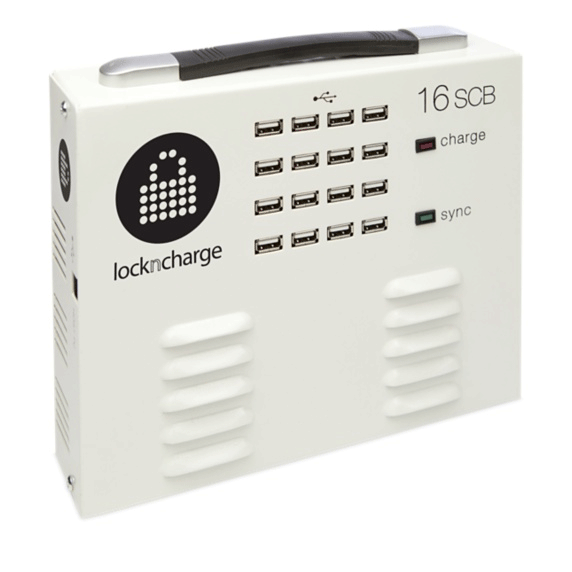 The iQ 16 Sync Charge Box can sync up to 16 iPad®, iPad Air™, iPad mini™ other iOS devices or Samsung devices simultaneously. It can also charge up to 16 iPad, iPad Air, iPad mini other iOS devices or Samsung devices in approximately the same time it would take you to charge one. Designed to be portable. The iQ 16 Sync Charge Box is a hand held USB hub that can be carried to locations where iPad or iPad mini devices are stored. Efficient charging. 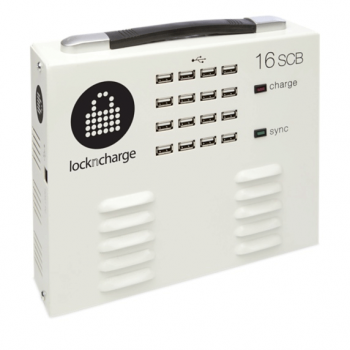 The iQ 16 Sync Charge Box is equipped with 16 (2.1 amp powered) USB ports so you can charge up to 16 iPad, iPad Air, iPad mini or iOS devices simultaneously. Portability. The iQ 16 Sync Charge Box is designed to be portable, made possible with the built-in handle and small design. This means that charging and syncing can occur almost anywhere. Simply carry the unit to where syncing and charging is required. Compatible. The iQ 16 Sync Charge Box is designed to connect with any iOS or Samsung device. Intelligent power management system. The iQ 16 Sync Charge Box automatically stages the availability of power to each port. This function prevents the potential of overloading the circuit and protecting your devices. LocknCharge Product Code: 10163 or LNC7001-A – iQ 16 Sync Charge Box Universal – works with both iOS devices and Samsung tablets. Specifications and images are for illustration purposes only. Final product may differ. iPad and MacBook are trademarks of Apple Inc., registered in the U.S. and other countries. iPad Air and iPad mini are trademarks of Apple Inc. The time taken to sync all devices will depend on the amount of content to be transferred and the number of devices connected.